This will be Grace’s fourteenth interview in the author series that started back on April 12th. I hope all of you are finding great new books and stories to add to your e-readers. Today we have Aliya Anjum and before I turn her over to Grace here’s a little about her e-book. Menaal is 30, attractive, western educated and committed to her career. She has hopes of meeting a special someone who would sweep her off her feet. Destiny takes its course when her ailing father arranges her marriage with the son of his friend, whom she has never met. Inspite of her aversion to an arranged marriage with a perfect stranger who has none of the qualities she seeks in a husband, Menaal accepts her father’s decision and marries her US based husband. Marriage completely turns her life around. She arrives in the US with her husband, and begins a journey that eventually takes her to new discoveries about life and herself. A 9,600 word short story inspired by true events. That is one gorgeous cover, Aliya! Your Muse must be doing a great job inspiring you. What’s the next project they’re helping you out on? My next project is my first novel. I have published adult short stories on Amazon before and won two prizes from the Pakistan National Book Foundation for (unpublished) children’s short story anthologies. I am enjoying writing my first novel, given it’s unique theme, which builds upon many contemporary themes. Awesome and Muse’s really love inspired storytelling. So, which of your characters are you most like? 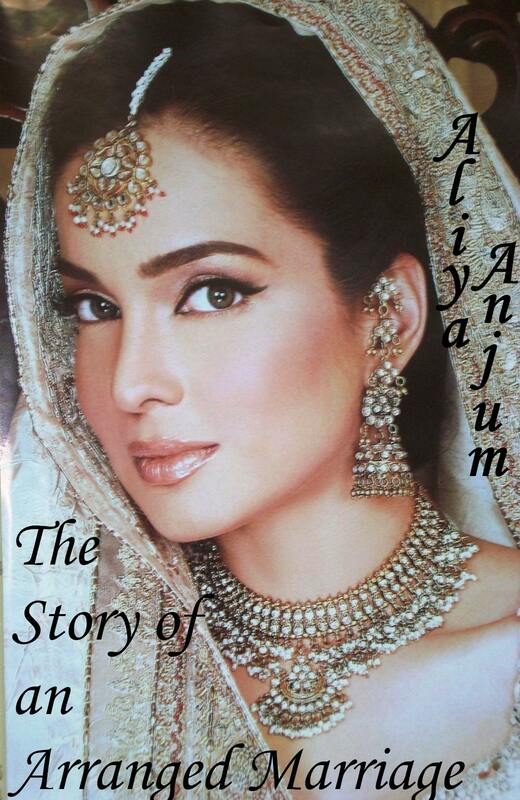 I’m like my heroine Menaal from my short story “the story of an arranged marriage.” She epitomizes grace and virtue. Wow! What a coincidence! My name is Grace and my roommate is a virtue…but that’s probably not what you meant. *blushes* Let’s just move ahead to the next question. What’s your favorite book of all time? I enjoy reading children’s fiction more than adult fiction. Alice in Wonderland still fascinates me, given it’s extraordinary story telling. What a great choice! My author loves that story. Okay, gonna do a topic switch-a-roo. In your opinion what makes a guy character swoony-worthy? He’s got to be serious eye candy and then he has to be a gentleman. No bodice rippers for me. Bodice rippers? I don’t get that, maybe because I’m an Angel. On the other hand, my swoony guy is eye candy. I do get that. And he keeps promising to take me to a concert. Hey! If you could go to a rock concert in Heaven, who would you go see? Definitely a great song and you’re gonna have a bunch of other authors there with you. Aliya, are you ready? ‘Cause I’m gonna put you on the spot. It’s confession time and I want to know your biggest writing sin? I eat chocolate when I write. It makes me pack pounds, then once I’m done with a project I need to diet. Yep, that’s sinful. My author likes chocolate too. Right now she’s doing mountain climbers to um…battle random bulges. Now, are you more of a rule follower or a rebel? Neither angel nor rebel. Somewhere in between. *winks* I kinda figured that out with the Elvis and the eye candy comment. But don’t feel bad because *whispers behind cupped hand* I’m still trying to get my wings, too. Can you tell me what other than chocolate (or your Muse) inspires you? Awww….I love, love, love this answer, Aliya!!!! Me too. That’s why I picked Guardian as my Vocation. It seems you could be one, too. If you were an Angel, that is. So, what do you want readers to take from your books? My non-fiction work is women’s literature. I’ve written about Pakistani/Muslim women and I want my reader to walk away with insights into the universality of human nature. That deep down, all people everywhere, want the same things in life and go through similar experiences in life, no matter where they live and what they do. My guardian angel is doing a very good job! Excellent! I’ll let them know you said so. We never get enough recognition. You can also keep up with her at her blog. Okay, so that’s it for today and tomorrow we’ll be back with Eileen Granfors. May 1, 2012. Tags: Aliya Anjum, author interview, confession, guardian angel, Shel Delisle, The Story of an Arranged Marriage, Winging It!. author interviews.